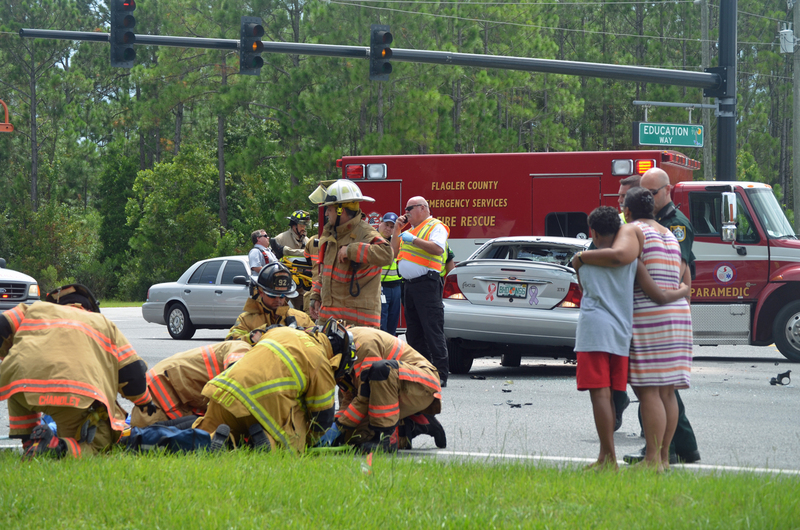 A child had to be evacuated on a trauma alert and two adults–each driver of the two cars involved–were taken to Florida Hospital Flagler with less serious injuries after a 2:30 p.m. wreck at the intersection of U.S. 1 and Royal Palms Parkway in Palm Coast. The identities of the injured is not yet available. 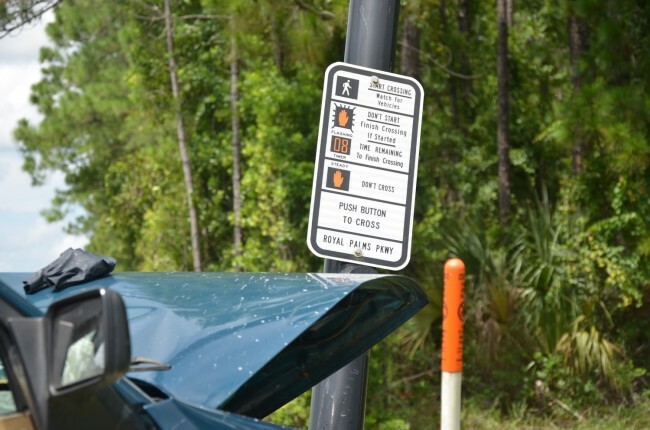 According to the Flagler County Sheriff’s Office, which is investigating the wreck, a Green Mercury Tracer was traveling north on U.S. 1. 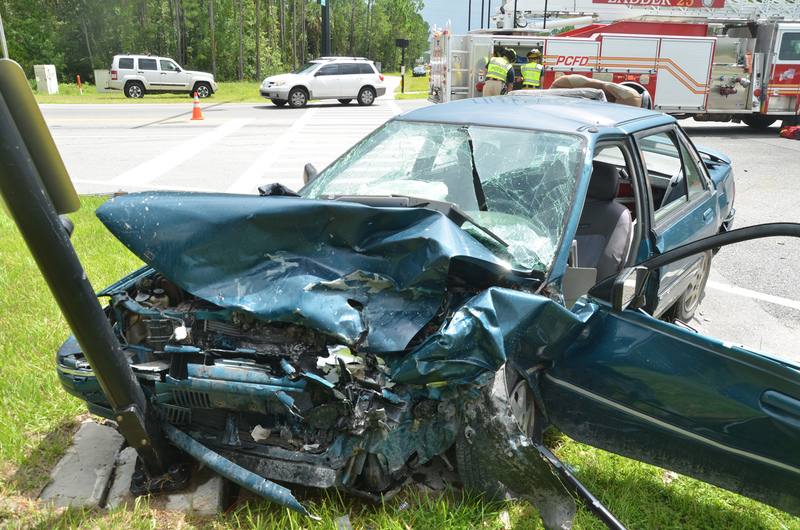 A man was at the wheel, a young teen was in the passenger seat. 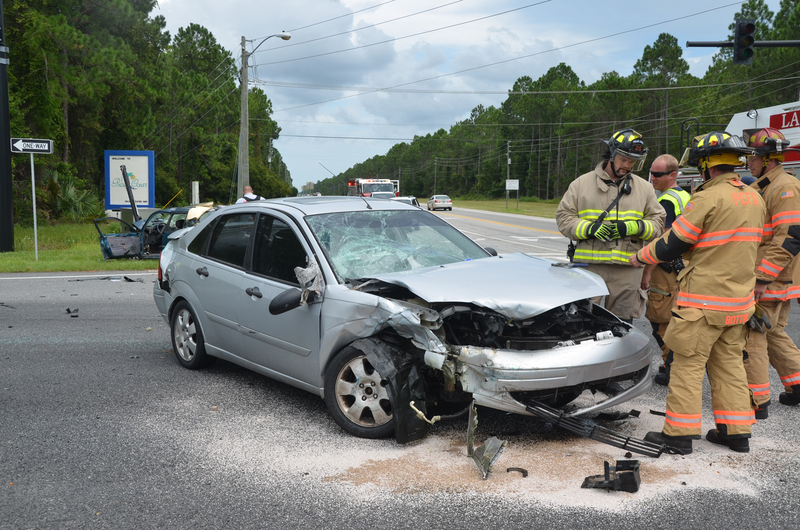 A Ford Focus driven by a woman was driving west on Royal Palms and attempting to make a turn onto U.S. 1. The two vehicles collided. The Mercury was impacted twice: from the collision, taking the blow on the front driver’s side, then again by a warning pole at the northeast corner of Royal Palms and U.S. 1. 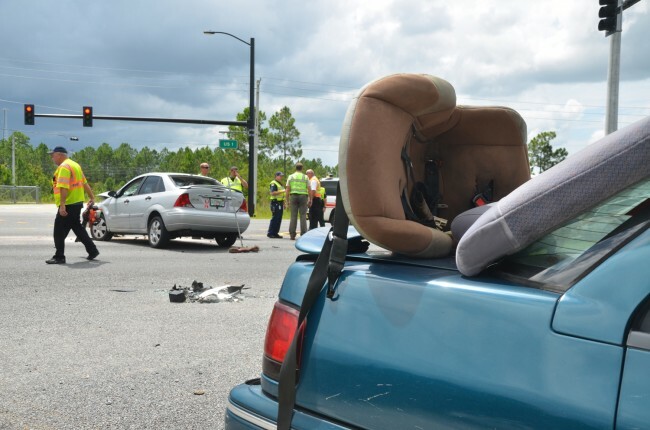 The Ford Focus, most heavily damaged on its front-passenger side, ended up roughly between the north and southbound lanes of U.S. 1. Both vehicles’ front windshields were smashed. The youth would have been evacuated by air to Halifax hospital, but went by ground instead because of unstable weather: a storm was gathering. Royal Palms westbound was shut down at Rymfire Drive. 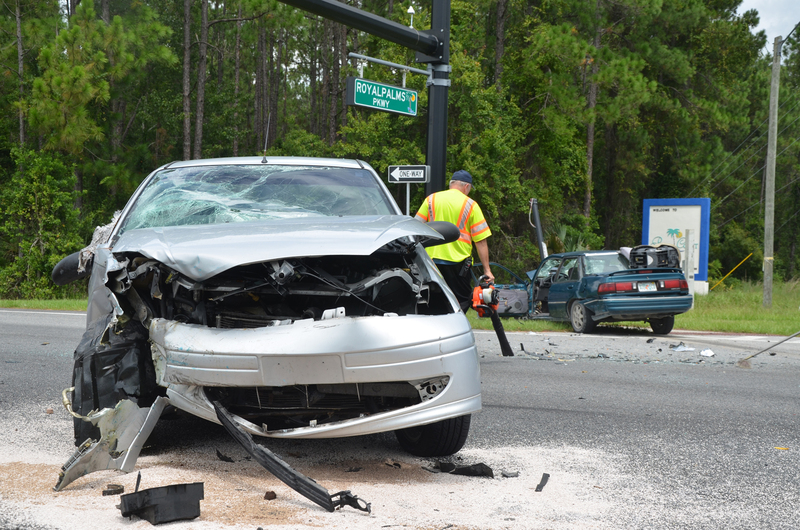 U.S. 1 north was shut down at Royal Palms. The wreck was cleared by 3:30 p.m. All lanes reopened at 3:33 p.m.
Flagler County Fire Rescue and Palm Coast Fire Department units responded to the scene, including Flagler County’s Capt. Ron Bolser and Palm Coast Fire Chief Mike Beadle, along with units of the Flagler County Sheriff’s Office. I prayer for all those involved in this terrible accident that they recover from their injuries. I hope everyone recovers. On another note, I thought putting traffic lights at every possible intersection was supposed to end all these crashes. It still won’t make drivers pay attention. This was my family, If any of you would like to know they are all doing fine! Who in the name of traffic rules decided to let motorists to make a left on red ??? I mean really. This is an intersection for an accident waiting to happen Its one of the only experimental lights in the county to see how long we can go without a wreck ,when I first saw this concept ,I had to laugh ,,thinking only its a matter of time ,it might be great out in espanola where the traffic is so heavy that a light ,of this nature would alleviate the major traffic jams that plague that area ,so come you engineer’s come up with some more great ideas to help traffic keep moving. Only in Flagler county!!! Where did it say in there that someone was making a left hand turn on red? Nowhere. Don’t assume. One did not respect the red light. I refer to the stretch of US1 from Old Dixie Highway north to Mantazas Woods Parkway “The Twilight Zone.” I have been driving for almost 50 years and have never seen anything like it for accidents. It’s baffling. My best to the families. That’s good news, Tatiana; glad they are all okay. oh well, so much for having more redlights. Who in the name of traffic rules decided to let motorists to make a left on red ??? Where is it stated you can make a left turn on red Mr.mondex??? No where! Although I have seen people make left turns on red arrow. Some people still don’t know the rules of the road but still get a license. Makes you kind of wonder?